For about 5 minutes, it appeared that Calvin Hayden, former sheriff’s deputy, would run unopposed in the race for Johnson County Sheriff. As noted yesterday, Sheriff Frank Denning has said he will not run for re-election. Meanwhile, the rumored Ed Eilert supported candidate, John Douglass, has found a cherry assignment working for the Shawnee Mission School District. So it appears he won’t be vying for the sheriff’s seat. How Stricker managed to get his mug on the television news announcing his campaign I’ll never know. Other candidates would run over puppies to make that happen. Somehow, Stricker managed it. I do not know if he has law enforcement experience. 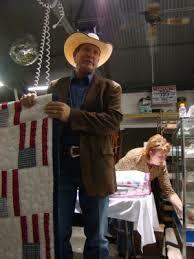 I do know Stricker has a lot of experience in cowboy hats and running a very successful auction. Stricker has plenty of his own cash to bankroll an expensive run for countywide office. Rumor has it he also has the backing of the Nigros. The race for county sheriff just got spendy.